for a 3rd grader, who likes to color outside the lines. Woo hoo! Sara Pennypacker’s latest book in the Clementine series is now available (Hyperion, $14.99)! These books, illustrated by the incomparable Marla Frazee, are my top recommendation for any early reader, who is ready for chapter books. Clementine and the Spring Trip is the 6th book in the series and there is due to be one final installment. Clementine, the first volume, is still my favorite, but this new one had me giggling all the way through. Clementine has the most delightful perspective on the world around her and I love love love that the adults in her life (parents, teachers, even the principal) recognize her uniqueness and support her, even when she’s challenging them. As many times as she has been sent to the principal’s office for not paying attention, the principal pays close attention to Clementine. Her parents encourage her to expend her energy in constructive venues (art, building projects, growing a garden) and never try to stifle her creativity. Her mother, the artist, and father, the building superintendent, have found happiness in their own lives and therefore are comfortable helping Clementine find her happiness. I admire the lack of DRAMA in these books, even as they are delightful to read and filled with clever stories and narratives. Pennypacker is excellent at recognizing the priorities of a third-grader (spring trip? great! but, not on bus 7, it smells!) and Frazee adds a tremendous amount of insight as well as humor into her illustrations: the image of the class gagging at the mere thought of riding bus 7 is perfect! Can’t wait for the final book. No! Stop! I don’t want this series to end! I picked up Wendelin van Draanen’s Flipped (Knopf, $8.95) years ago on a business trip because the cover is so great. It is streamlined, uncluttered, and just intriguing enough to spark my curiosity. The back matter is also very well done, the two stories are intertwined and upside down. You read Bryce’s story from top to bottom and then flip the book over to read Julianna’s. I bought the book and read it over dinner. (I once read this Dilbert comic where he says to the server, “I’m not a loser who can’t get a date; I’m a business traveler.” I’d always think about that line when I was traveling for business and eating alone.) Anyway, Flipped is really amazing. I’ve re-read it several times over the years and I love it every time. Julianna and Bryce are in 7th grade, but they met the summer before 2nd. They live across the street from each other and even this tiny distance completely affects their perspective on what’s happening between them. Each chapter flips the story; we hear Bryce’s perspective and then Julianna’s. Or the other way around. Not only are their stories flipped, from the beginning Julianna has flipped over Bryce. Julianna is a phenomenal character. She’s not like all the other kids and her unique perspective on the world, along with her ability to rise above and see the bigger picture, makes her one of my all-time favorite literary characters. Bryce tries really hard to keep his feet on the ground, and stay safe, but he grows on you. It might be his bright blue eyes. Or maybe it’s because he starts to step outside his comfort zone and flip his own perspective, slowly becoming even more awesome than the one-dimensional image of him that Julianna has created. Although, by this time Julianna’s own views about Bryce have started to flip . . .
for a ten year old, looking for inspiration. The Wheel on the School, by Meindert DeJong and pictures by Maurice Sendak, is one of those books that I ignored for a long time (HarperTrophy, $6.95). It looks a little dated. I thought it was a strange title. I simply wasn’t interested. But every once in a while I go on a Newbery kick and try to read award winners from various decades, just to see. So far I have never been disappointed with a Newbery book. Isn’t that funny? There are so many issues that go along with the reward and I know how political it can be, but through it all, those librarians always manage to choose really good books! I love it. The Wheel on the School is about . . . well? . . . what it is about? Storks, I guess. I could try to describe the plot line, but I don’t think I could convince you that it was worth reading. Instead, I’ll say it’s about one child sparking a chain of events that eventually empowers an entire community to work towards a common goal. It’s about how little things can have a huge impact. It’s about never underestimating the residual effect of curiosity. In the town of Shora, Netherlands, Lina wants to know why there are no storks in her village. Her teacher, probably one of my favorite teachers in children’s literature, asks the class to all think about what would happen if they started to think about storks. Eelka wants to know how anyone in the class can possibly think about storks if they don’t actually know anything about storks? Storks don’t come to their town, remember? To which the teacher replies: “True, true . . . We can’t think much when we don’t know much. But we can wonder! From now until tomorrow morning when you come to school again, will you do that? Will you wonder why and wonder why? Will you wonder why storks don’t come to Shora to build their nests on the roofs, the way they do in all the villages around? For sometimes when we wonder, we can make things begin to happen”. For a rather quiet book about storks, The Wheel on the School has a lot to say. Give it to a kid who is wondering. See what they create. for an 8th grader, who values doing what’s right over doing what’s popular. I enjoyed Gordon Korman’s Ungifted so much that I decided it was time to read some of his other books. I don’t know why I’ve never read his stuff before; he is great! 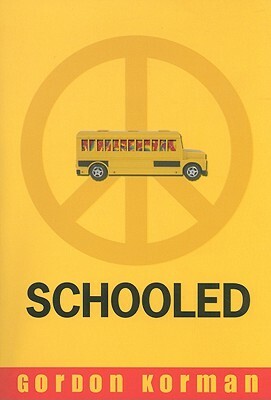 Schooled (Hyperion, $6.99) is a quirky book about Capricorn (Cap) Anderson, who has spent his entire life living on the all but abandoned commune left over from the 1960s. His grandmother, Rain, is the sole remaining resident and has raised and educated Cap entirely on her own. When she falls out of the plum tree, Cap, 13, drives her to the hospital, ending in his arrest (driving without a license) and a brief stint in the home of a social worker, who happens to have spent part of her childhood in the commune. And so Cap starts junior high. Little does he know — because honestly there isn’t much Cap does know about the outside world — the class’s biggest loser is always voted in as President of the 8th grade. When Cap is elected, when he is pranked, and when he is teased by his classmates, he takes it all in stride. Anger, jealousy, and vindictiveness are all completely outside his frame of understanding. Instead, he strives to do his best in his new position, as he knows it’s what Rain would expect of him. The longer that Cap stays true to himself and the principles that he’s learned from Rain, the more the student body starts to recognize and, sometimes begrudgingly, accept his strength of character. His belief in the individual skills of his classmates ultimately yields its own brand of community. Cap is adorable. The narrative alternates between a number of characters, which allows for a more comprehensive development of the school environment. Korman utilizes this rotating narrative strategy effectively in both Schooled and Ungifted and conveys equal parts disdain and sympathy for both the school bully, Zach, and Hugh, Zach’s biggest prey (besides Cap). He also paints a very realistic picture of the middle school experience. According to Hugh, “Adults are always trying to figure out what makes kids tick. . . . Know what? They don’t have a clue”. The adults in Korman’s books, at least the ones I’ve read so far, do try really hard but they often miss the point, demonstrating that Korman, himself, does have a pretty good clue. I’m going to start recommending his books to kids who have read and enjoyed Andrew Clements’s school stories. I’m also really excited to eventually read more of Korman’s books and will let you know if they measure up to these two. for a teenager, who is home sick in bed all day. Minus the teenager part, that’s me. home sick today. ugh. What’s even worse is that I wasn’t scheduled to work anyway. So I spent my day off, which is currently experiencing lovely weather, alternating between chills and a fever. I’m better now and hoping it was a 12-hour bug and not the nasty 48-hour thing that everyone else seems to have. So what to read when you don’t have the energy to do anything else? Well I just finished My Most Excellent Year by Steve Kluger (Speak, $8.99) and I really enjoyed it. Chapters alternate between three main narrators: T. C. Keller, Augie Hwong, and Alejandra Perez. Each section includes a variety of communication forms, email, text, IM, office memos, about some of which the narrators aren’t always aware. This range of communication offers a more comprehensive picture of these three freshmen’s ‘most excellent year’. Set in Boston, T. C. and Augie have been brothers since T. C.’s mom died and the two families melded to the point where Mom, Dad, Pop, as well as extended relatives don’t bother to differentiate biological relations. During their ‘most excellent year’ T. C. and Augie maintain their close bond, but they both begin to develop new relationships. T. C. meets Alejandra, who has just moved to town, and Hucky, a six-year old, who alternates between foster care and a home for children with hearing impairments. Augie, more to his surprise than anyone else’s, meets Andy Wexler, who is just as surprised to be falling for Augie. Alejandra, who has spent her life as a diplomat’s daughter somewhat cut off from her peers, starts to make real friends and discover her own talents in theatre. Along the way, each of them fully begins to appreciate that families are made by surrounding yourself with the people who love and support you and that there’s always room for one more.